HI there, I’m new around here so thought I’d introduce myself before I launch into teaching you how to trick your children! My name is Kylie and I am a mum of 2 who also educates people on how to use Essential Oils to improve their health and wellbeing, teaches women about their menstrual cycle and is a primary school teacher. Many hats worn here but most are focussed on health and wellness which is my biggest passion. Like most parents I face the same battles in terms of getting my kids to eat nutritious food; in our house our children seem to have this aversion to any green vegetable in its original form, yet for some reason the moment it is blended to within an inch of its life they have no issues eating it! When I discovered this, it was like they had set me the biggest challenge, “how many vegetables can I sneak into a recipe without them noticing and still devouring it?”, this is where my veggie pesto was created. 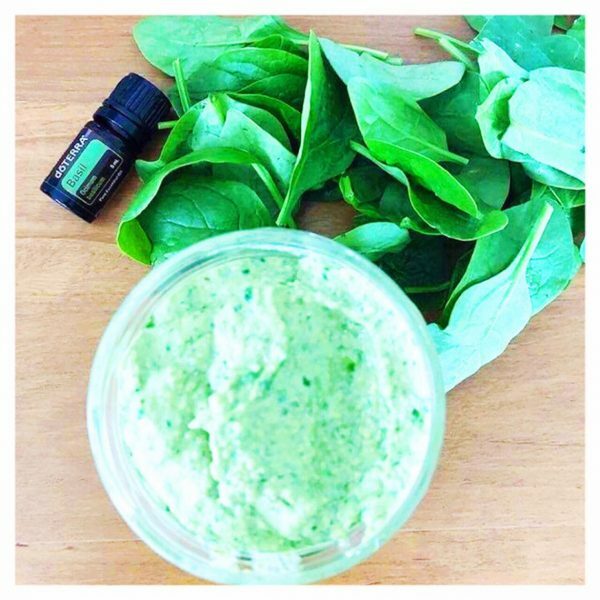 I am an avid lover, user and educator of doTERRA Essential Oils to care for mine and my family’s health and overall wellbeing and I will use them safely wherever I can, so this pesto recipe gave me the opportunity to have the flavour of pesto without having to wait for Basil to be in season (at the right time of year you could of course use actual Basil). Winter is the perfect time for comforting pasta recipes but this pesto is not limited to delicious pastas, we also spread it on some Zeally Bay Sourdough toast and top with a poached egg, add it to frittatas, scrambled eggs, spread on chicken and then bake it in the oven, add it to Bolognese or Lasagne as well as add it to some olive oil for a delicious salad dressing. It freezes well and we always have empty glass jars on hand for freezing portions of pesto for quick dinners or flavour enhancers. This time of year is the perfect time to gather all of the ingredients required for this recipe from The Organic Place and make a batch in bulk to save yourself time later. Before getting to the specifics I should point out here that I am someone who generally ‘wings it’ in the kitchen so my measurements are never usually specific and I always go by look, consistency and flavour so feel free to adjust as needed. I’d love to hear how you go with this recipe so please feel free to follow me on Instagram @nourishednaturally_kryan or like my Facebook Page ‘Nourished Naturally with Kylie Ryan’ and get in contact if you loved it! Hi there! I’m new around here so I thought I’d introduce myself before I launch into teaching you how to trick your children! My name is Kylie and I am a mum of two. who also educates people on how to use Essential Oils to improve their health and well-being; teaches women about their menstrual cycle; and is a primary school teacher. Many hats are worn here but most are focused on health and wellness which is my main passion. Like most parents I face the same battles in terms of getting my kids to eat nutritious food. In our house our children seem to have this aversion to any green vegetable in its original form, yet for some reason, the moment it is blended to within an inch of its life they have no issues eating it! When I discovered this, it was like they had set me the biggest challenge, “How many vegetables can I sneak into a recipe without them noticing and still devouring it?”. This is how my veggie pesto was created. I am an avid lover, user and educator of doTERRA Essential Oils to care for my and my family’s health and overall well-being and I will use them safely wherever I can. So this pesto recipe gave me the opportunity to have the flavour of pesto without having to wait for basil to be in season (at the right time of year you could of course use actual organic basil). Winter is the perfect time for comforting pasta recipes but this pesto is not limited to delicious pasta. We also spread it on some Zeally Bay Sourdough toast and top with a poached egg; add it to frittatas; scrambled eggs; spread on chicken and then bake it in the oven; add it to Bolognese or Lasagne; as well as add it to some olive oil for a delicious salad dressing. It freezes well and we always have empty glass jars on hand for freezing portions of pesto for quick dinners or flavour enhancers. This time of year is the perfect time to gather all of the ingredients required for this recipe from The Organic Place and make a batch in bulk to save yourself time later. Before getting to the specifics I should point out here that I am someone who generally ‘wings it’ in the kitchen, so my measurements are never usually specific and I always go by look, consistency and flavour. So feel free to adjust as needed. Steam the broccoli, cauliflower and zucchini until nice and soft. Allow to cool but reserve the cooking water for later use. Place nuts in a high-powered blender and blend until finely chopped. Add spinach/kale, parmesan/nutritional yeast, lemon juice, Olive Oil, Basil essential oil/basil into the blender and blitz until semi smooth. Taste the mixture to determine how much salt needs to be added and if more lemon juice is required. Once the steamed vegetables have cooled, add them to the blender and blitz them with the pesto. Add some of the reserved cooking water to the pesto to achieve a nice saucy consistency.